I have this image of Three Gossips taken in color at the sunset, but I added gradient and changed color balance to make it look like a distant memory, because I will share some almost forgotten, and for most of you, unknown memories… in my next blog, Part II 🙂 But first, let’s go back to the story about our Southwest travels. 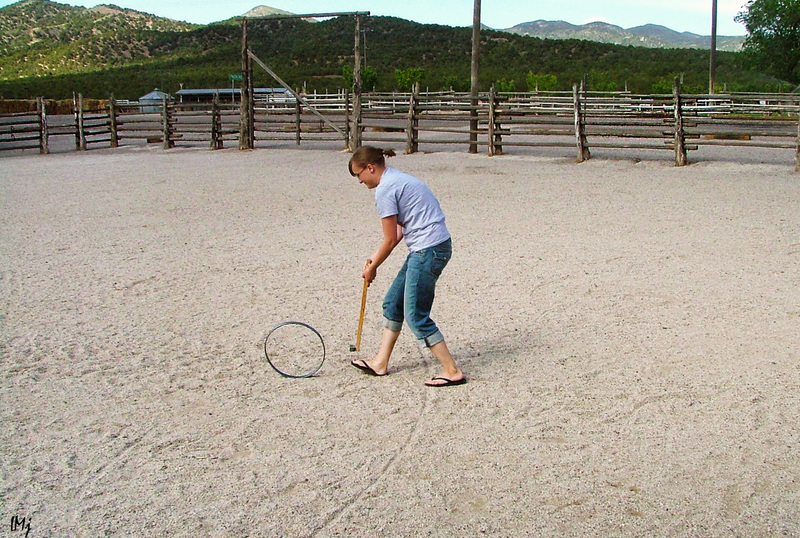 We have made two trips to Southern Utah and Northern Arizona, in 2007 and 2008. Our first trip included: Arches National Park, Four Corners, Little Colorado River Gorge, Marble Canyon, Grand Canyon, St George, Cove Fort – a round trip we had made in five days. Morning – Devil’s Garden Trail and Landscape Arch ( 2 hours) and probably another 2-3 hours if you want to walk to the end of the trail ( we didn’t); Double Arch ( 30 min); The Windows ( 1 hour). It is just how long it takes to walk. You will need more time – driving, taking photographs, sitting and admiring the scenery. 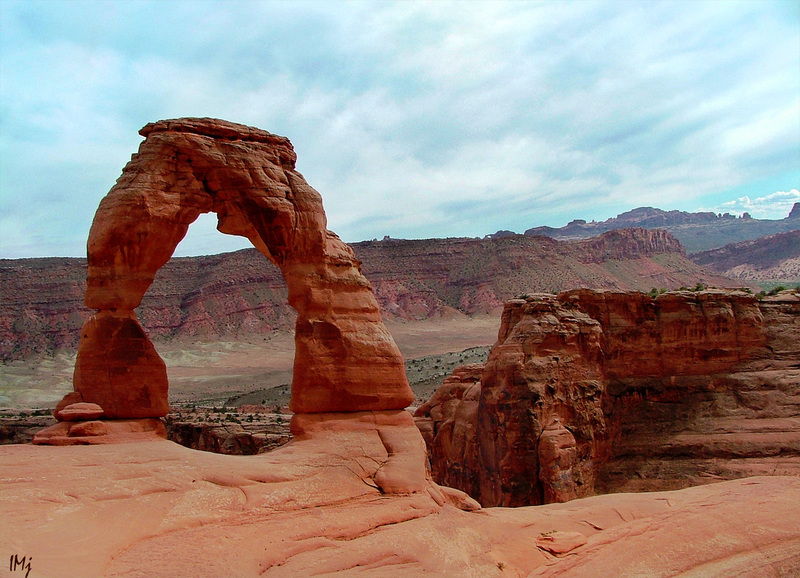 Afternoon – Delicate Arch ( at least 3 hours; parking is limited! ); Balanced Rock before the sun goes down ( 30 min). Check the map to calculate how long it takes to drive from place to place. Check out the links to the long and short trails, but regardless of the distance you have to take a lot of water with you. 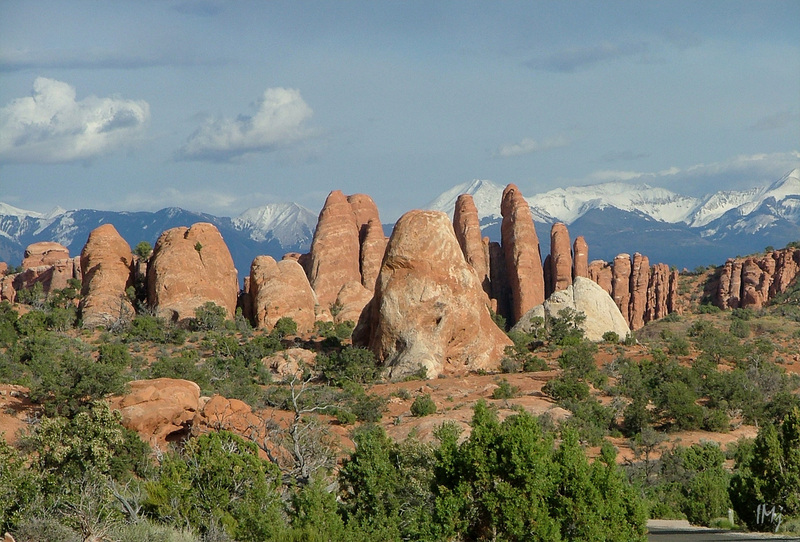 There are 2000 arches in Arches Nation Park. Well, perhaps 1999, since the Wall Arch collapsed in August 2008. The best photographs of Delicate Arch come out in the afternoon. We went there first thing in the morning. It made sense because we had no idea how long it takes to hike, and we really wanted to stay there a little longer. Photography wasn’t our priority. In the first photograph, Delicate Arch is just around the corner. The weather is changing to overcast, and the arch looks differently every half and hour. 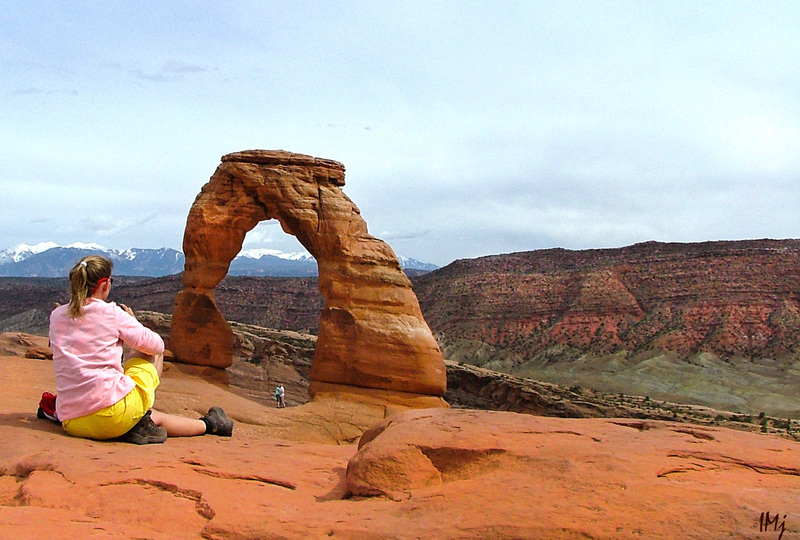 Sitting there and staring at the arch was one of my favorite activities in the Park. If you have been there you know what I am talking about. 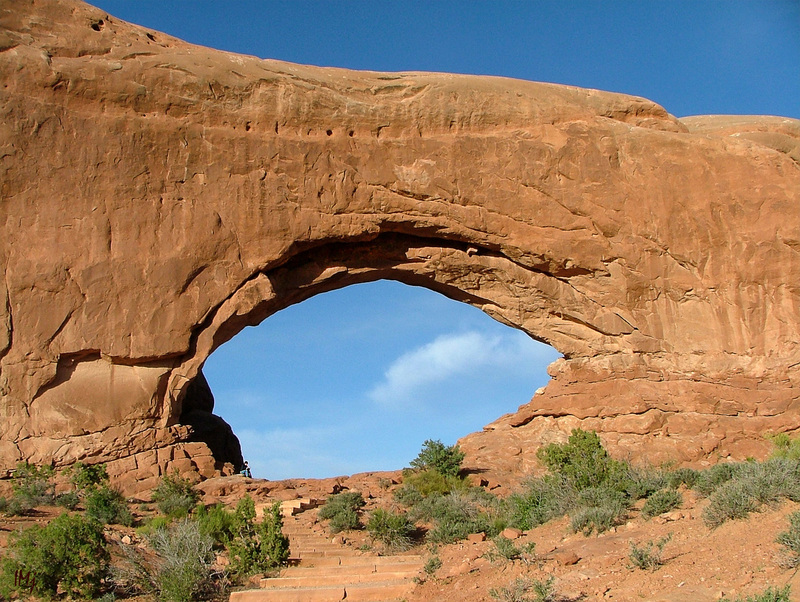 This is the Landscape Arch, or what is left of it after the first slab of sandstone fell off in 1991. Still, it is the longest natural arch in the world with the span of 290 feet. 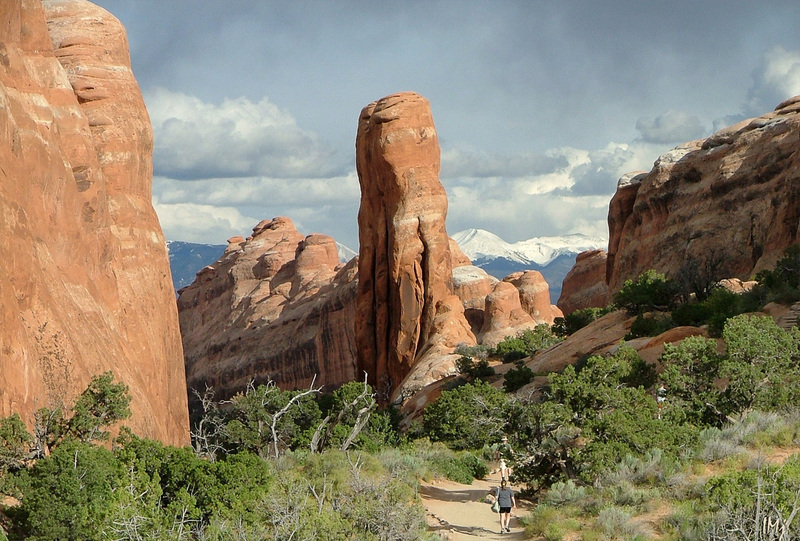 It is the Devil’s Garden trail, the most spectacular of all the trails in the park. 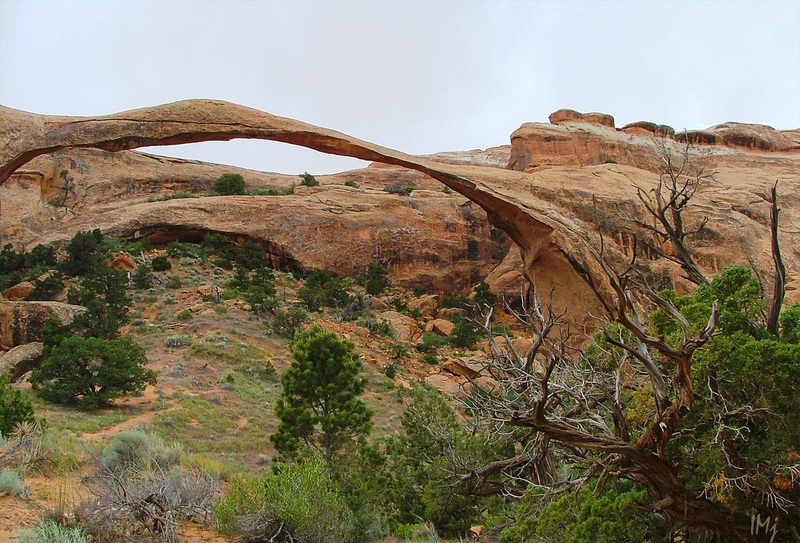 The weather was changing, and by the time we reached the Landscape Arch, it was raining and we turned back. These formations are called “fins”. I mentioned them in my previous blog. The rain stopped and we actually visited more arches than expected. 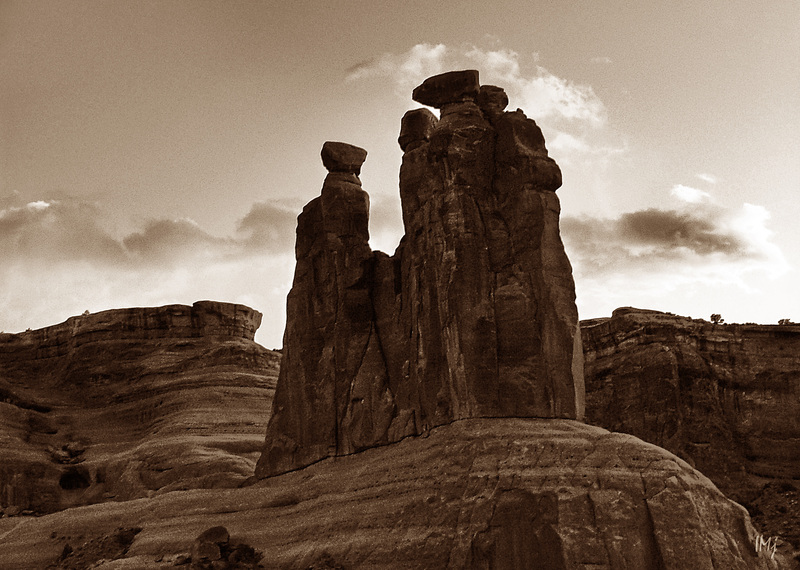 We took beautiful photographs of the Balanced Rock half an hour before the sunset, and the Three Gossips a minute before the sun went down. This is the Window Arch. For the scale, see a tiny human sitting in the left corner. 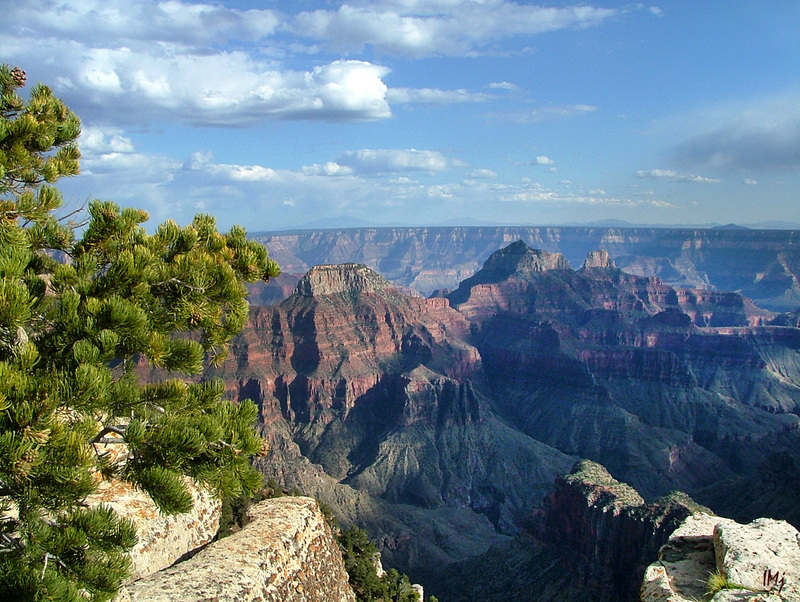 The following day we started our unhurried trip to the Grand Canyon, a ” hole in Arizona”. It is hard to put the Grand Canyon in words and pictures, and yes, “not all holes are created equal” 🙂 I was standing there speechless and almost breathless. South Rim, Colorado River. Here we spent a day, hiking around and down in the canyon. North Rim, the following day. There, we took a short but breathtaking Bright Angel Point trail. We walk along the narrow ‘peninsula’, surrounded with the stone ‘waves’. 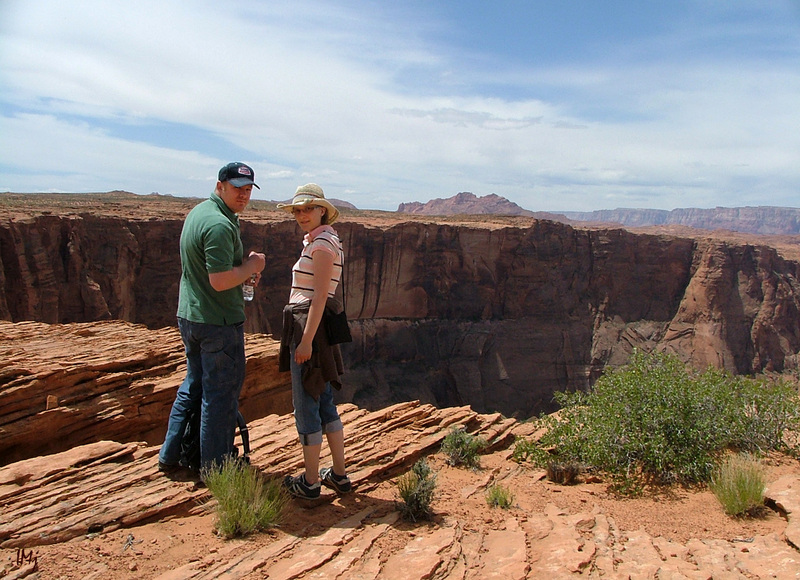 At the end of the trail, The Bright Angel Point, most of people just stand and stare across the vast expanse. It is difficult to believe that this is all real. I think you will love reading this very informative and very poetic article about the area down there. Reading displayed information I had to smile. What is the Bright Angel Fault? As I learned, faults are fractures in the Earth crust that occur under the pressure – compression, extension or side-by-side movement. 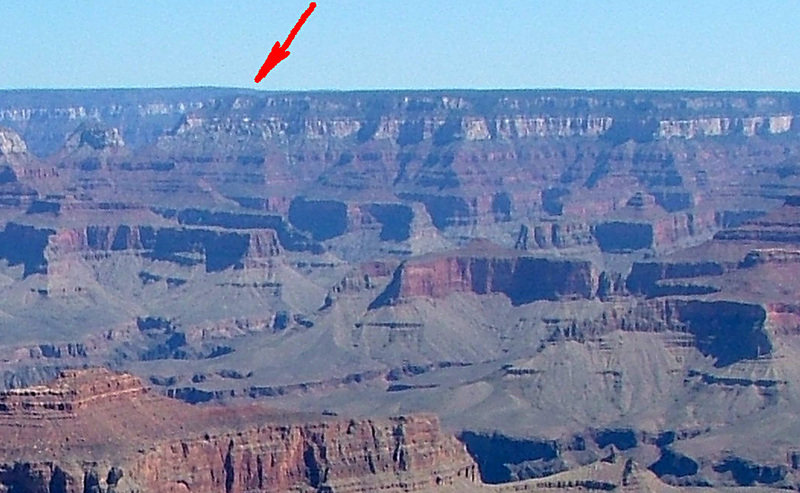 The Bright Angel Fault is such a fracture that stretches almost straight across the Grand Canyon from the South to the North through the Bright Angel Canyon, which was formed through erosion along the fault. 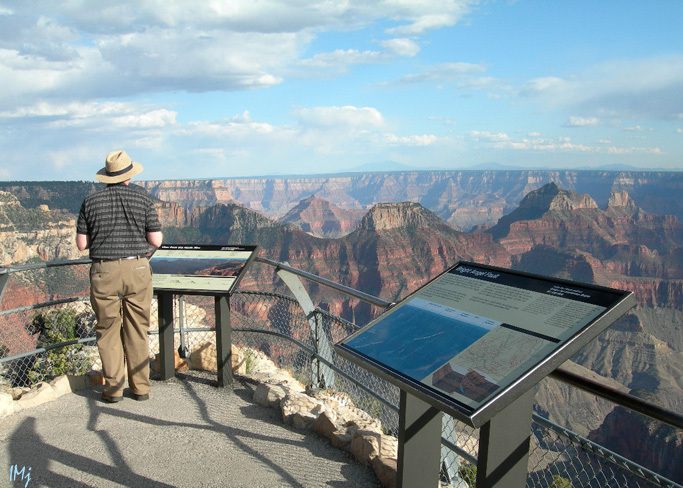 Yes, the view that we see at the view point is not technically the Grand Canyon, but a side canyon, the jagged border ridge of the Bright Angel Canyon! I have read a lot about the side canyons, and I still have more questions than answers. 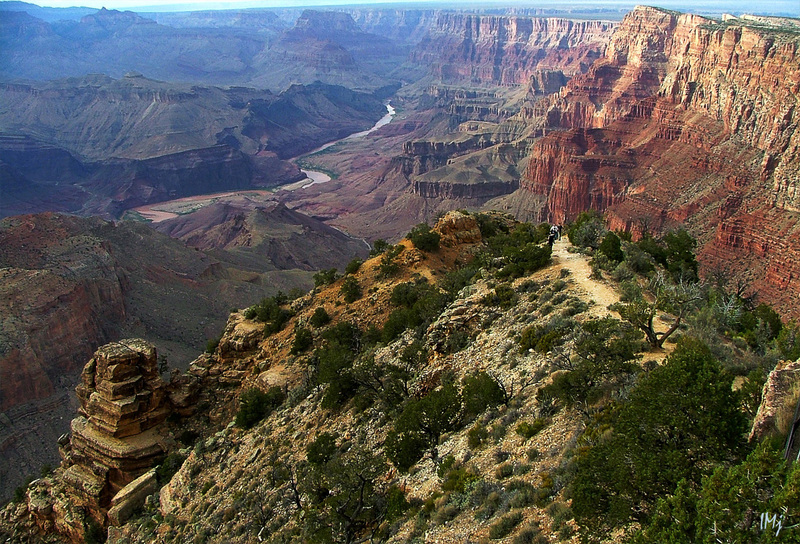 I know that I will never hike the Grand Canyon and see everything by myself. I can only pray that the people who go there in the future are considerate and respectful to the Nature. Little Colorado River Gorge, and Marble Canyon and Navajo Bridge are worth to mention not only because they are located on the way to Grand Canyon National Park and to stop there seems like a natural thing to do. These places are beautiful. Cross both – New and Historical Navajo bridges, and enjoy the emerald color of Colorado river if you travel early in summer. Little Colorado river is a bright blue color, but later when the rains start, they both become chocolate milk brown, and as the saying goes ‘ too thick to drink, too thin to plow’. 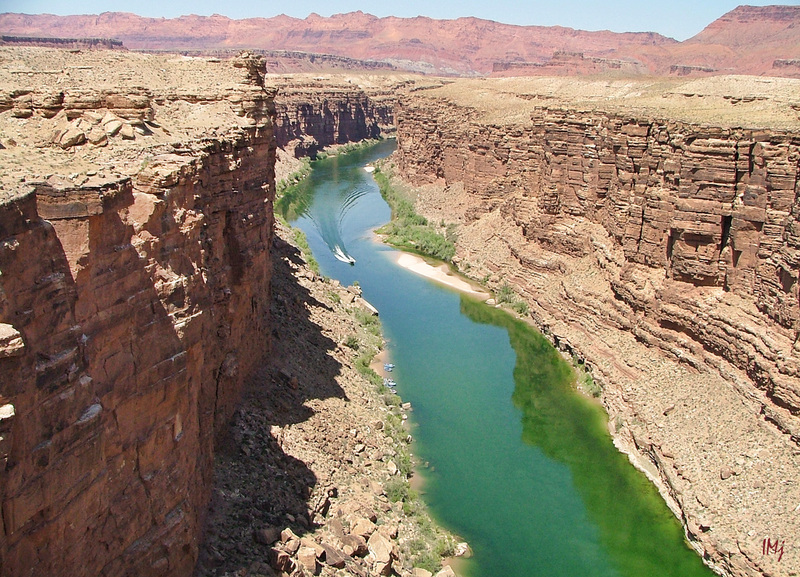 Marble Canyon and the Grand Canyon join where the Little Colorado River enters the Colorado River. 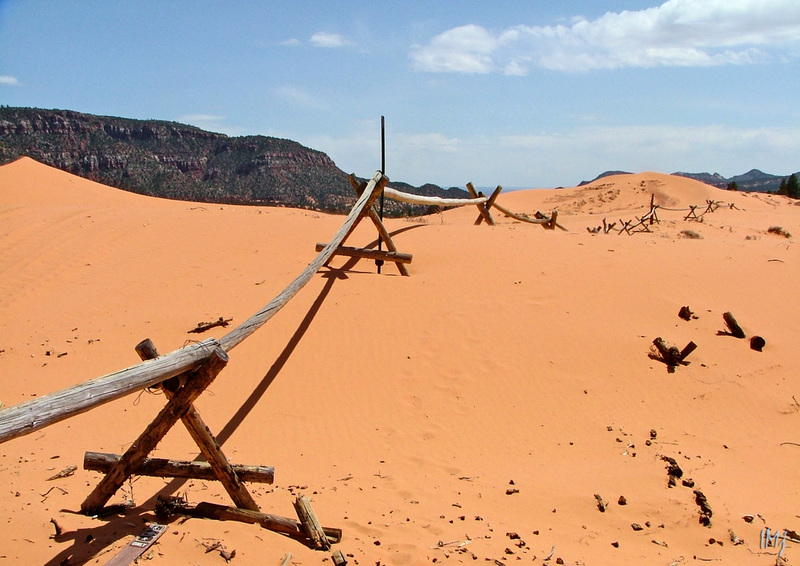 In the image below, a view from the Old Navajo bridge. On the way back, we had a stop in St. George, UT, and visited their Pioneer Park. We climbed up the Dixie Rock for the downtown panorama, and I can tell you that the place is certainly worth to stop by. There is a wonderful book – Travelers’ Tales, American Southwest: Arizona, New Mexico, Nevada, and Utah… A great read when you feel nostalgic. The other trip was also a five days long trip : Coral Pink Sand Dunes, Lake Powell and Rainbow Bridge, Horseshoe Bend, Upper Antelope Canyon, Monument Valley, Mexican Hat, Utah State Route 261 and Moki Dugway, Natural Bridges National Monument, Utah State Route 95 across the end of Glen Canyon, and a long drive through the breathtaking canyon country up to Salt Lake Valley. As I said, we travel with no hurry. 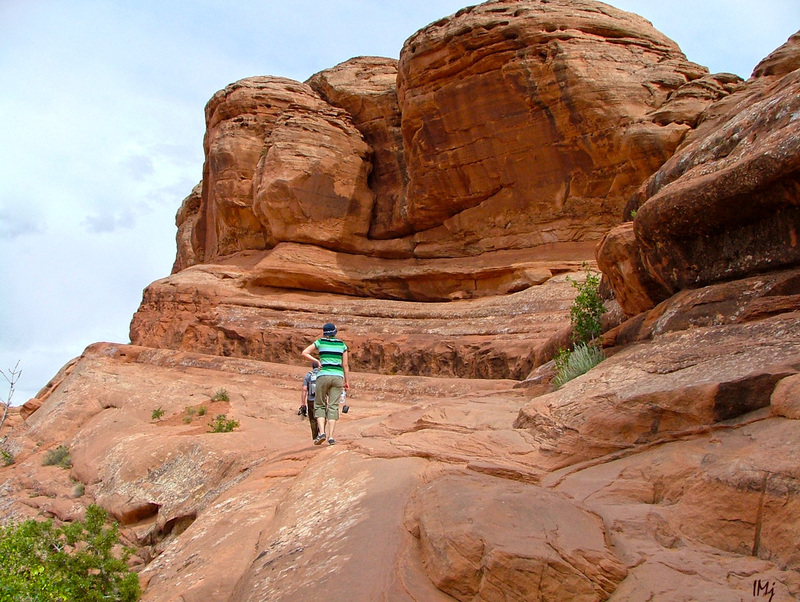 We stop to admire buttes and mesas; we even climb them sometimes. 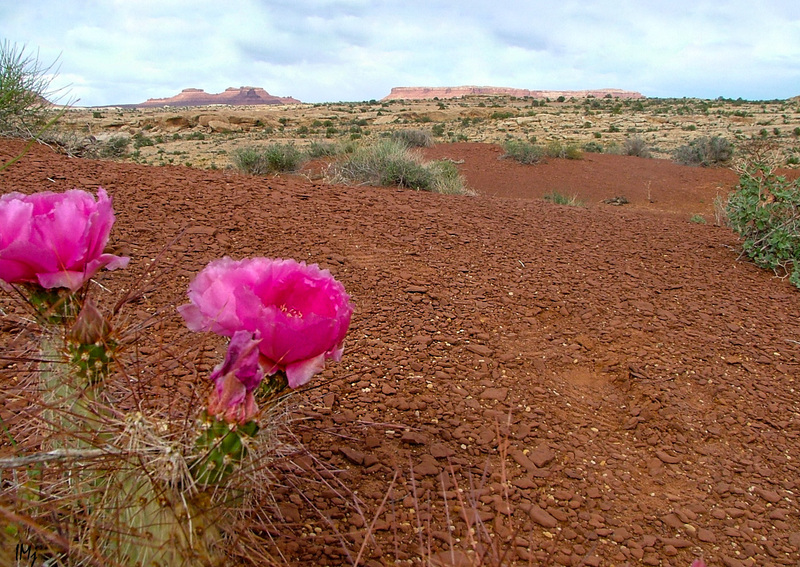 We buy Native American jewelry made from seeds, beads and semiprecious stones; we watch the wildlife and marvel at the flowers bravely standing out against the barren rocks. One cannot plan discoveries and surprises. On our way to Page, AZ we turned into the side road to check out a unique place, a part of Zion National Park – Pink Sand Dunes. We stayed in Page three nights exploring the area. 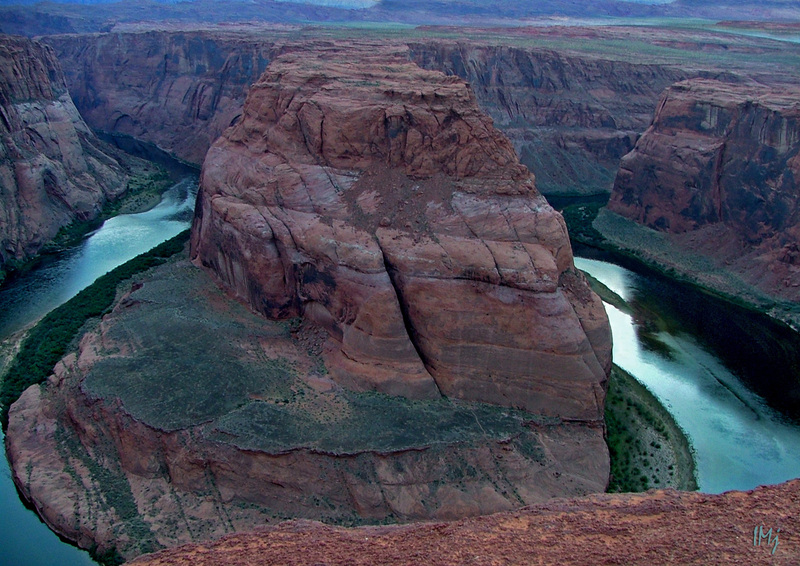 Horseshoe Bend was one of the places on our list. I failed to take a good picture, but my daughter had a good fun taking pictures of me wriggling on my belly towards the rim with my camera holding hand outstretched, and with the mortified face. Due to the embarrassing nature, these pictures may not be published. We went there again after dark. The full moon lit up the waters of Colorado River; wildlife enjoyed the coolness of the night, and we enjoyed watching the cottontails happily run around. I didn’t get any braver, and this sorry picture is the best I have got. Another place on our list was Antelope Slot Canyon. Probably many of you have heard about the tragedy that happened there in August 1997. We went to the safer and easier of the slots, the Upper Antelope Canyon ( the Upper and the Lower slots are a few miles apart) . 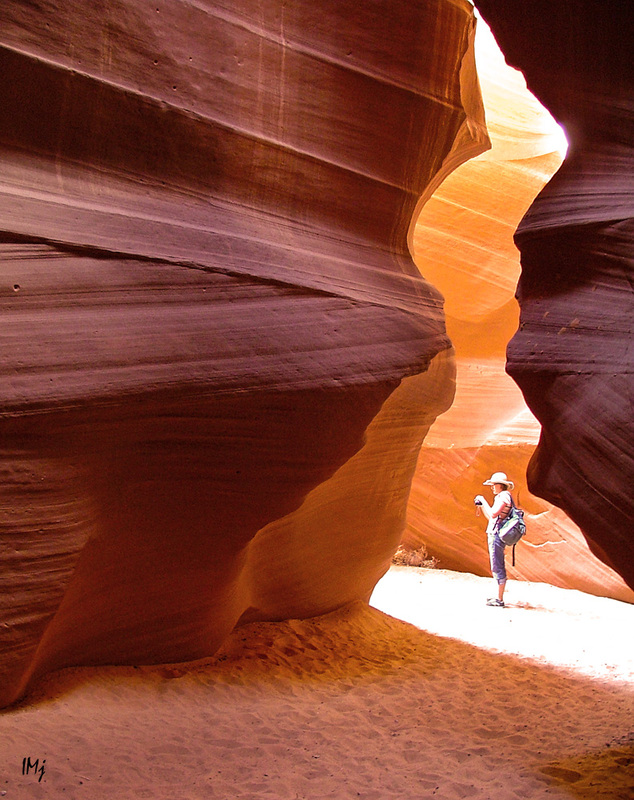 All the land around Page, including Antelope Canyon, belongs to the Navajo Nation. It is a family business, and we got a handsome young man for a guide, a University student who was on holidays at that time, and not only gave us photography tips, but also played the flute for us. 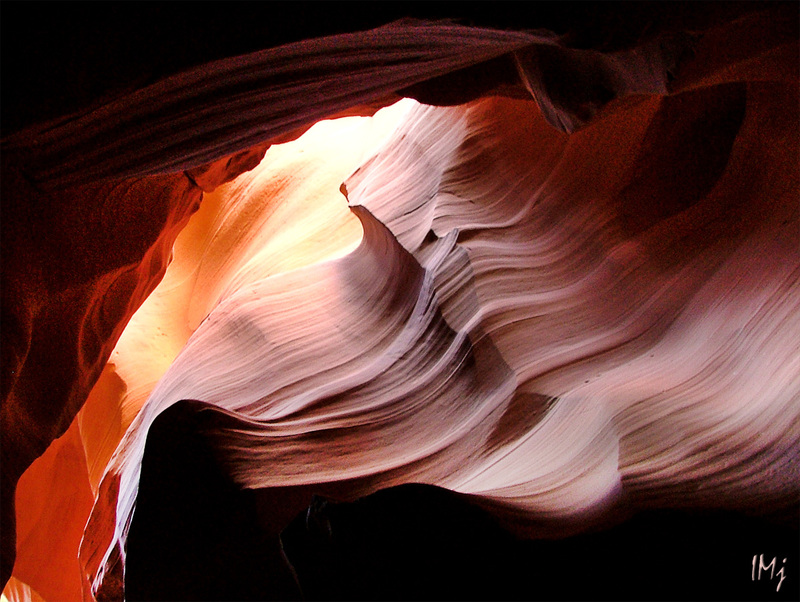 Antelope Canyon is one of the most mesmerizing places on Earth, where the light is everything. The corkscrew walls polished by flash floods change their color every second as the light bounces between the twisted columns. In the image below – Slot entrance. Images taken inside the canyon, available light. Yes Inger, if no hurry, we would see much more. It was 7 years ago, but I remember everything like it was yesterday – it is how stunned I was. I so hope you see it all. Thank you so much! It was 8 years ago. I would love to go again, and have more time. <- that's me, mind boggled! Loved this post…took me back to the feel of this great place. A great series of photos, and You have quote too that says it all “You come there in awe, and you leave in awe.” Wish I would have visited Antelope Canyon when I was there…surreal place. Thank you! I wish I have visited the Lower Antelope! Then there is The Wave – you can google the place. They only sell a certain amount of the passes each day – 10 or 15. I think one has to dedicate their whole life to explore this area. Your photographs of the land are outstanding. I hope you go there again soon. We went to Arizona in May, and Colorado river was green when the weather was dry 🙂 Even after the rain the river regained its green color soon enough. Thank you so much for your kind comment! You are so lucky living close to the Parks! I know it was my first and last trip. These old photographs are all the memories I have. Thank you again! Thank you so much for your kind words! I would love to go again with a better camera than the one I had 8 years ago, but it seems impossible. Hello Sheldon! Have a peaceful week! Beautiful pictures! 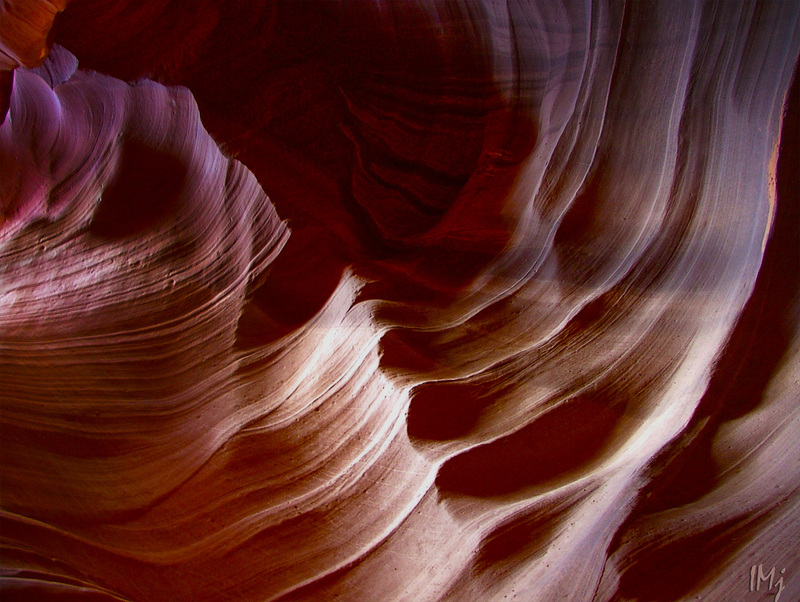 I especially like the ones of Antelope Canyon. I really hope I get a chance to go there the next time I’m out that way. Thank you Michelle! Since we went there, many thing have changed. Lower Antelope Canyon is fitted with metal stairways, and is quite accessible too. That’s good to know! Thanks! Thank you so much! Yes, they look like that indeed 🙂 Future hoodoos. Thank you John. Not bad photos for that time and that camera 🙂 The memories are much more colorful. Loved your pix Ines! I think you have seen a lot more of the west than I have and I’ve been there a few times myself. Beautiful country! Thank you for stopping by! We traveled to AZ a good few years ago, and it was certainly my first and last trip to the area. I don’t see any other chance to travel that big anymore. I would love to go again, of course, with a more advanced camera 🙂 The life is too short. Oh, I am so sorry about your lens 😦 Do you have back up lens? Overall I can see you took amazing images during your trip. Antelope Canyon looks stunning! Indah, don’t be sorry, it happened 8 years ago, and I even don’t remember which lens it was :). I just remember it was a wide one because I missed it badly when I was struggling to capture the Horseshoe bend 🙂 Antelope Canyon is stunning indeed, but the other one, where those people were killed by the flash flood, is much more spectacular. It is where all the photographers usually go. When you plan your trip one day, go for the Lower Antelope. We were not physically fit for it. I am sure some things changed since I was there, but the stunning beauty of the land is still the same. Thank you 🙂 You make me smile 🙂 A genius is the one who created Malice 😉 And I AM serious. Thank you for your kind comment, Derrick! Wonderful post Inese. Your photos are lovely and I so enjoyed ‘travelling’ with you. It is a magnificent post. I have never seen only from an airplane this land. Once I have wanted to try standing here. Beautiful traveling post! The post gives me some ideas when I have a chance to get to these places some days. I am sorry to hear you lost your WA lens there. By the way, I like the rendering of the “Three Gossips”. Thank you Olga! Happy that you have special memories about this land! Beautiful! One of my very favorite bloggers, inesemjphotography.com. Thank you Sheldon! Glad you have memories of this beautiful land. Wow this is stunning Inese! Oh I don’t know if I want to ‘like’ this comment… Don’t give up easy. Jobs are going and coming again. Don’t feel discouraged, and keep an eye on the offers. I love desert with all my heart. It is where I would live myself, the rest of my life. Hugs!!! Inese – Exquisite photos and wonderful narrative, as always. It’s been years since Tom and i have visited this area of the country but we shared memories as we viewed your photos together and read your commentaries. You do our country proud. Sheri, thank you so much! Glad to hear that you have traveled in the area. These memories are precious. Nothing like this in the whole world. Quite unbelievable what the landscape can do to itself, stunning pictures all of them. If I had to pick one, it would have to be the Canyon, the fins too, actually all what the heck. Thank you! I hope you travel there one day. It is not that impossible – here on wordpress you can meet friends who live nearby and give you a ride. You see how much we covered in only five days. These two trips together might be done in a week. I sure hope so to travel there one day. You can never say never. Stunning pictures. I must admit my heart nearly exited my mouth a couple of times when I saw the heights. Thank you so much, David! I am afraid of heights myself. Hugs!!! This is the third time I am leaving a message. I do not know what is going on with wordpress today but 2 of them disappeared into thin air. Wow! Your photos do not do justice to the beauty you have brought to us. These photos are awesome and I must thank you for taking me on the tour with you. To be there and feel the actual energy would have been awesome. The arches reminded me of a big camera lens that you can view the landscape in. No harm in imagining. Be well and thank you again. Wow beautiful photos of your trip. I do know that pictures do not do justice to the scenery you have brought to us. To be there in person and feel the energy of the moment would be awesome. The arches remind me of a big camera lenses looking out onto the landscape. One can imagine. No harm in doing that lol. Be well and thank you for taking me on the tour as well. Thank you! It is why I posted just a few photographs. It is rather an idea for somebody who is planning a trip of their own. 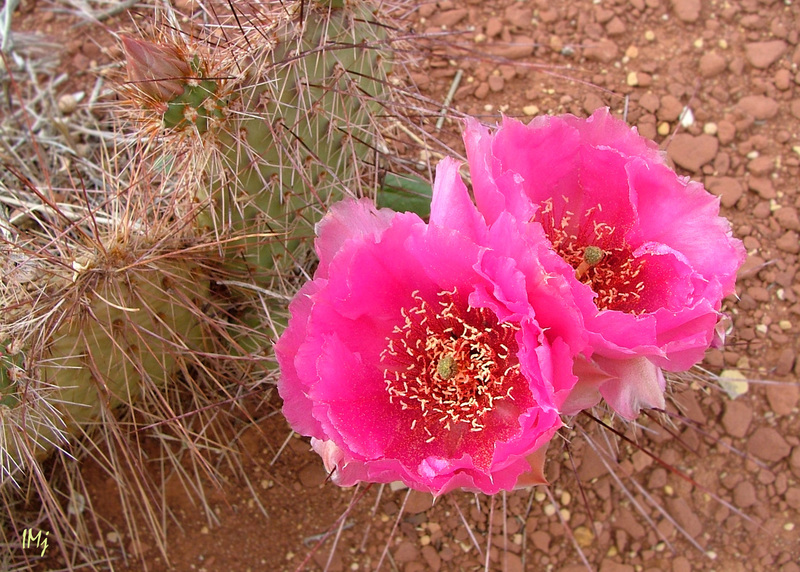 Your photos were a marvelous testament to the beauty of the desert southwest, Inese. Thank you so very much for sharing them.